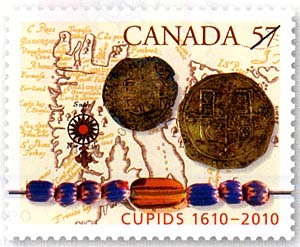 On August 17th, 2010, Canada Post began issuing a stamp commemorating the 400th anniversary of the settling of Cupids, Newfoundland. It is the site where British merchant John Guy landed in August, 1610, and where the first English settlement was established. It is also the site of the first child born to European parents on the continent. In 1996, archaeological remains were found of the original colony. Since then, many artifacts and remains of structures have been dug up. Some of these artifacts are featured on the commemorative Canadian stamp, as well as an image of the first English map of Newfoundland.